Efflorescence - A white, chalky, crystalline residue on walls. Efflorescence is a sign that water or moisture was absorbed into the masonry, cement or concrete at one time. The moisture in the masonry walls and floor, has dissolved some of the water-soluble ingredients like lime and calcium. When these minerals dry out, crystals form, leaving efflorescence. High Humidity – If high humidity is the cause of your problem, the white residue will usually be uniform over a large broad area. Often times, you can see staining up to a certain height on the wall and it occurs at a generally consistent height. The reason high humidity can cause efflorescence, is because high humidity leads to condensation forming on the masonry surfaces. Condensation causes beads of moisture to form on the cool surfaces and is absorbed into the porous cement. Remedy For Excessive Humidity: Buy a good dehumidifier for your basement. A dehumidifier will physically remove the extra moisture from the air, allowing your basement everything stored in it, to dry-out through evaporation. When the humidity level is dry enough, your tools, appliances and other metal objects will no longer continue to rust. Even a basement that doesn’t leak can benefit greatly from using a dehumidifier. Keep all doors and windows in the basement closed year-round. Open doors and windows allow more humid, moisture laden air to enter the basement and cause problems. 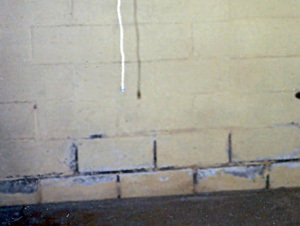 Wall Cracks and/or Failed Parging – Once you get a crack in your masonry walls, the parging that keeps out water, fails. 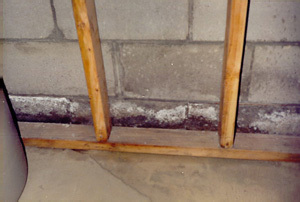 Because the masonry is porous, it will wick in water or moisture. When the moisture dries out, the minerals and other water soluble ingredients that leached out, begin to crystallize. This looks like white powdery stains on the walls and is called efflorescence. Remedy for Wall Cracks: If the wall cracks are not too deep underground, its possible to dig outside along that area and re-parge the walls using an elastomeric coating that will keep up with the constant expansion and contraction of your foundation. Its important to carefully read the warranty from contractors that provide this type of work. Many will only guarantee these type of repairs for a year or less. To Remove Efflorescence – Wear a dust mask and wire brush all the loose material off. Using a chemical etching solution will also be helpful. The surfaces should then be primed before applying a sealer. Read the product instructions to make sure all the materials you are using are compatible.